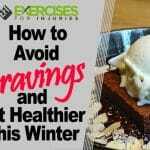 In the winter months, it’s hard to resist gaining weight. The cold weather makes it less inviting to go outside and exercise. It also leads to cravings for warm, heavy comfort foods that feel great going down, but tend to pad the waistline. Then, there is the problem of the short winter days and our reduced exposure to sunlight. That can result in low levels of vitamin D, which compels the body to store more fat. If that lack of light makes you feel sad or depressed, you’ll also crave more carbohydrates to make you feel better — and dense carbs are more likely to turn into fat than other types of foods. 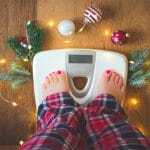 You may not gain a lot — a pound or two — but the trouble is that you probably won’t be able to lose it during the course of the next year. That leads to the “slow creep” of weight gain that tends to plague most of us as we age. 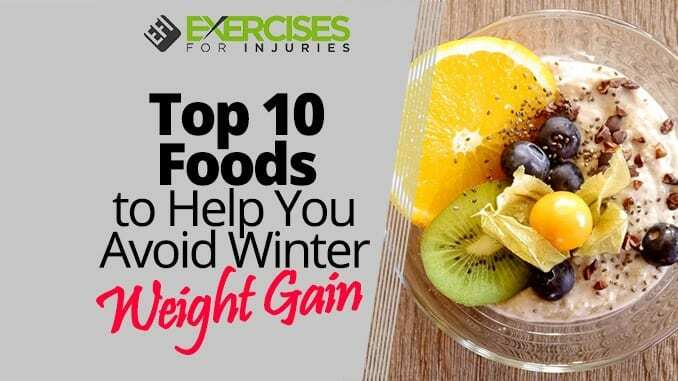 Fortunately, you don’t have to accept winter weight gain as inevitable. One thing you can do to protect yourself is to choose your foods carefully. 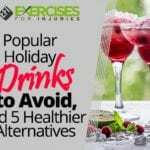 The ones we’ve listed below can actually help you maintain the weight you have, and will also support any weight-loss efforts you may make. Soups are warm and comforting in the wintertime, and they also tend to be filling, but low in calories as long as you choose the broth-based ones, not the cream-based ones. Chicken noodle, vegetable and other similar flavors provide good-for-you vegetables, healthy protein and even a few immune-boosting spices, all without contributing to weight gain. If you’re struggling with a cold or the flu, chicken soup may even help you get over it faster. Hot oatmeal makes the ideal breakfast in the winter, not only because it’s warm and comforting but because you can dress it up with all sorts of healthy things to start your day off right. Add some berries, chopped nuts, raisins, cinnamon or whatever sounds good, and your body will enjoy the nutrients while you enjoy the feeling of being full. In fact, when it comes to lasting energy, oatmeal wins against regular dry cereal. In a 2016 study, those who ate oatmeal increased fullness and reduced hunger and took in fewer calories later in the day than those who ate regular cereal. These and other winter squashes are in season during the colder months, and they’re rich in fiber and low in calories. That means they’ll fill you up without filling you out. A serving of butternut squash has only 63 calories, for example, yet the fiber will keep you satiated. If you’re trying to lose weight, add squash to your meals as often as you can. You can even use it as a partial substitute for cheese in your pasta and casserole recipes. Whereas other fruits may look rather anemic during the winter months, you can still rely on citrus to taste good. Choose oranges, grapefruits, clementines, lemons, limes and the like for their high vitamin C content and fiber. Some research has also suggested that citrus can help support weight loss. In 2013, for example, researchers found that those taking a blend of extracts from red oranges, grapefruit, sweet oranges and guarana experienced a 5.71 reduction in waist circumference compared to only 1.56 percent in the placebo group. They also experienced a 9.73 percent reduction in fat, compared to 3.18 percent in the placebo group. In a 2014 animal study, researchers found that subjects fed a high-fat diet who also drank grapefruit juice gained 18 percent less weight than those who drank water, instead. We need more studies to determine what citrus can really do when it comes to weight but, for now, upping your intake of citrus fruits is a good idea during the colder months. If you’re craving potatoes, choose these over white potatoes. They are lower on the glycemic index, which means they won’t break down as quickly in your system. That helps you stay fuller, longer and keeps your blood sugar levels stable, which helps you avoid weight gain. We have some evidence that sweet potatoes may actually help you lose weight. In 2016, researchers found that the “wastewater” left over after people had boiled or steamed sweet potatoes actually helped animal subjects to lose weight. The subjects also had lower cholesterol and triglyceride levels and higher levels of the appetite-controlling hormone called leptin. Researchers believed that it was the sweet potato peptide in the water that was the cause. Granted, the subjects consumed the leftover water, not the potatoes themselves, but it’s an intriguing study. Either way, sweet potatoes are a filling, nutritious and satiating option for winter. If you’re a fan of chili, have more of it during the winter. All those beans will keep you full for a long time because they’re packed with fiber. The dish is warm and comforting — ideal for a cold, windy day. Those spicy peppers will help protect you from bacterial and viral infections, rev up your metabolism and help you lose weight. According to a 2015 study, when researchers added capsaicin — a major compound in chili peppers — to a high-fat diet, it prevented weight gain. The theory is that the capsaicin turns bad, unhealthy white fat into fat-burning brown fat. This type of rice is rich in healthy antioxidants as well as fiber and vitamin E. It will help you stay full, longer and may even help keep your cholesterol levels under control. Also called the “forbidden rice,” it is less popular than other rice varieties, but it actually has more antioxidants than they do, is a good source of fiber and protein and one serving contains only about 160 calories. Studies have found that black rice can help protect the arteries from dangerous plaque buildup, reducing the risk of heart disease while contributing to healthy cholesterol levels. It’s naturally gluten-free, helps tame damaging inflammation and is found in most health food stores. If you’re craving something sweet, fruit is always a good option, but if you want something more indulgent, choose dark chocolate with at least 70 percent cocoa. This type of chocolate is high in healthy antioxidants, and if you consume it in small amounts, you’ll feel satisfied without overdoing it in calories. According to a 2011 study, those who ate dark chocolate felt more satisfied, less hungry and consumed fewer calories later on than those who ate milk chocolate. 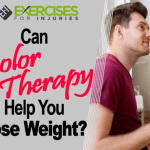 It also helped satisfy cravings as after the participants ate the dark chocolate, their cravings for something sweet, fatty or savory were all lower than they were after eating milk chocolate. There are a number of reasons why this food is perfect for winter. For one, it’s creamy and fun to eat. It’s packed full of protein, which will help keep you satisfied, and it’s also a good source of probiotics, those live bacteria that have been linked with weight loss. In a 2014 study, for example, researchers found that certain probiotics could help women lose weight and keep it off. During a 24-week period, those taking the probiotics lost twice as much weight as those who didn’t. Tests also showed that they had lower levels of the hunger-stimulating hormone leptin in their systems. The strain used in this study was slightly different from the strain found in American Greek yogurt, but researchers stated that they believed the probiotics found in American yogurt could have a similar effect. Other studies have found various benefits from probiotics, including that they may help inhibit the absorption of dietary fat, increase the release of satiety hormones and improve gut health. Mushrooms have a firm, meaty texture that is satisfying in the winter. They’re low in fat and a good source of protein, and they have a moderately high amount of fiber. They’re also a good source of potassium and B vitamins, and contain L-ergothioneine (ERGO) — a powerful antioxidant and anti-inflammatory. Here’s more good news: mushrooms have been linked with weight loss. In October 2017, researchers revealed that eating a mushroom-rich breakfast may result in less hunger and a greater feeling of fullness compared to eating a breakfast with meat. Participants ate two servings of mushrooms or meat for 10 days, and those who ate the mushrooms reported less hunger and greater fullness than those eating meat. An earlier study also found that portobello mushrooms, in particular, helped women shed some pounds. All participants consumed a drink with glucose (sugar) in it, but one group’s drink also contained portobello powder. Women who consumed the drink with the portobello powder in it showed a constant decline in after-meal insulin levels. That means the mushroom powder helped even out blood sugar levels, which makes it easier to maintain and lose weight. You can use whatever mushrooms appeal to you, however. All of them are nutritious, extremely low in fat and carbs, and very tasty. Rebello CJ, et al., “Instant Oatmeal Increases Satiety and Reduces Energy Intake Compared to a Ready-to-Eat Oat-Based Breakfast Cereal: A Randomized Crossover Trial,” J Am Coll Nutr., 2016; 35(1):41-9, https://www.ncbi.nlm.nih.gov/pubmed/26273900. Shane Starling, “Citrus extract shows weight management potential: Study,” NutraIngredients.com, https://www.nutraingredients.com/Article/2013/09/03/Citrus-extract-shows-weight-management-potential-Study. Rostislav Chudnovskiy, et al., “Consumption of Clarified Grapefruit Juice Ameliorates High-Fat Diet Induced Insulin Resistance and Weight Gain in Mice,” PLoS One, October 8, 2014, http://journals.plos.org/plosone/article?id=10.1371/journal.pone.0108408#s1. Koji Ishiguro, et al., “Effects of a sweet potato protein digest on lipid metabolism in mice administered a high-fat diet,” Heliyon, 2016; http://www.heliyon.com/article/e00201. “What’s next in diets: Chili peppers?” Biophysical Society, [Press Release], February 8, 2015, https://www.eurekalert.org/pub_releases/2015-02/bs-wni020415.php. 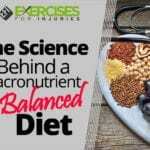 “10 Awesome Health Benefits of Black Rice,” BalanceMeBeautiful.com, http://www.balancemebeautiful.com/awesome-health-benefits-of-black-rice/. L B Sorensen, and A Astrup, “Eating dark and milk chocolate: a randomized crossover study of effects on appetite and energy intake,” Nutr Diabetes, December 2011; 1(12):e21, https://www.ncbi.nlm.nih.gov/pmc/articles/PMC3302125/. Marina Sanchez, et al., “Effect of Lactobacillus rhamnosus CGMCC1.3724 supplementation on weight loss and maintenance in obese men and women,” British Journal of Nutrition, April 28, 2014; 111(8):1507-1519, https://www.cambridge.org/core/journals/british-journal-of-nutrition/article/effect-of-lactobacillus-rhamnosus-cgmcc13724-supplementation-on-weight-loss-and-maintenance-in-obese-men-and-women/7C9810D79528C4ADC77A22EE45F9CA8E. Hrefna Palsdottir, “How Probiotics Can Help You Lose Weight and Belly Fat,” Healthline, June 3, 2017, https://www.healthline.com/nutrition/probiotics-and-weight-loss. “Feel fuller, longer with mushrooms,” Mushroom Council, October 19, 2017, [Press Release], https://eurekalert.org/pub_releases/2017-10/mc-ffl101717.php. Liza Gates, “Mushrooms are Magic for Women Trying to Lose Weight,” The Daily Beast, May 22, 2014, https://www.thedailybeast.com/mushrooms-are-magic-for-women-trying-to-lose-weight.